Located atop Caneel Hill just outside of Cruz Bay, St John and celebrating the islands’ finest ingredients and freshest locally sourced product. Asolare features French techniques infused with Asian ingredients creating a cross cultural cuisine which delights both the palate and the eye. We complement Asian Fusion cuisine with impeccable service and unparalleled sunset views of the Caribbean Sea and the glittering lights of the north shore of St Thomas. Formally constructed as a single family home in the 1950s, Asolare once played host to elite St John residents such as Laurence Rockefeller. In 1994, entrepreneur Winston Bennett converted the home into a restaurant and thus Asolare was born. A true, authentic Italian Restaurant Experience in the US Virgin Islands. Having relocated directly from Italy, the Owners have brought with them the best Italian recipes featuring homemade pastas and wood fired pizza all hand crafter with the fine imported ingredients. Located downtown in Cruz Bay St John. Da Livio offers an Italian Paradiso here in America’s Paradise! Buon appetite e benvenuti! Extra Virgin Bistro was established in 2015 under the leadership of General Manager/Owner, Ryan Costanzo, and Head Chef/Owner Tommy Garfield. At Extra Virgin Bistro the team is dedicated to locally grown and sourced products, so much so that we grow most of our own herbs on site. We buy most of our fish from local fishermen and you will often find their names printed on our menu next to the fish they brought us that day. We take tremendous pride in consistently delivering to you a delicious and personal dining experience – with upscale, innovative dishes emphasizing clean, crisp, fresh ingredients without being fussy or heavy. Casual by day and white tablecloth tropical chic by night, within a stone walled courtyard, built in traditional Danish style plantation architecture, visitors & locals alike give rave reviews for our inspired lunch and dinner menus. 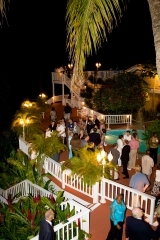 Dinner is served under the stairs amid swaying palms in our beautiful and romantic courtyard and gazebos. You will find our dinner menu to b comprehensive and innovative with something for everyone at the table. But save room for dessert as our pastry chef will delight you with a sinfully delicious handcrafted dessert menu that changes daily. The Mahogany Bar offers a full range of cocktails from the perfect icy martini to scrumptious tropical concoctions. We present an excellent wine list as well as wines by the glass. Serving Cocktails & Dramatic Sunsets NightlyAfter starting his life in a two-person tent on the flats or Coral Bay St John. This Johnson & Whales graduate was recently named by Zagat as one of Zagat’s Top 30 Under 30 Chefs! He got his start first roaming and foraging thru the valley, fishing off his father’s boat and cooking for his many brothers and sisters in St John. Ocean 362 Chef Shaun Brian harmoniously brings to life the philosophy of locally grown items blended with the science of modern gastronomy. Sourcing the freshest product from the St. John farmers and fisherman, he prepares his food to highlight unique local flavors. At The Terrace Restaurant, located in the heart of Cruz Bay, St John we strive to provide you with a French inspired, fine dining experience. With our blend of classic French techniques, high quality ingredients, a professional and knowledgeable service team, and a beautiful waterfront location in the heart of St. John. You will recognize the faces of our restaurant as experienced, knowledgeable, and welcoming food and wine personnel of St John. Robin and Chef Erica Miner combine years of culinary experience with a love of St John and the perfect waterfront location to make this St. John dining experience one to remember. A Minimalist Canvas Where the Food is allowed to Take Center Stage.Offering contemporary American cuisine in an upscale, open air environment. Located directly on the beachfront in the center of Cruz Bay. This eatery’s spacious interior, offers tables spaced apart just enough to afford privacy. For an upscale restaurant like Waterfront Bistro, the experience is all about the food but also about the ambience. With a simple and clean décor; white linen and umber all combine to create a minimalist canvas where the food is allowed to take center stage. Presented beautifully, offering seafood and meat dishes spotlighted by entrees such as lamb loin and duck and complemented with an award winning wine selection.